Memory loss, forgetfulness, memory lapses and cognitive function with aging is not inevitable. In fact, the brain is very much capable of producing new cells at any age, it’s just about knowing those helpful tips to promote a healthy brain. Our memories are a cherished part of who we are. When we recall moments that we have experienced, for a brief moment we are able to relive those memories. Each time a memory is formed it becomes ingrained in who we are and who we become. Our experiences greatly shape us, and when they become memories they stay with us for the rest of our lives. Unfortunately, this is only true if we can maintain our memory. Over time we can develop age-related memory loss. It’s quite stressful to be unable to recall events or simple things we need to do in a day. We may begin to feel disconnected from those around us which can lead us on a path to isolation. For these reasons, age-related memory loss is a major fear associated with aging. If age-related memory loss is a fear of yours as well, there are things you can begin to do in order to hold on to your precious memories. Below are tips on how to prevent memory loss and enhance memory power. Exercise: Physical exercise can work wonders on your brain power and towards maintaining your memory. Harvard reports that those who partake in exercise can maintain a healthy brainwell into their 80s. First of all, exercise maintains healthy lung function which has shown to be the case in those with strong minds. Secondly, exercise helps with illnesses like diabetes and can help lower blood pressure and cholesterol which can impair memory. Lastly, research has shown exercise to promote neurotrophins which work to nourish the brain and protect it against damage. Although there is no set amount of time to exercise, research suggests exercise doesn’t have to be intense, so it doesn’t matter what your physical level is; you can exercise at your own pace to enhance memory power. Exercise doesn’t necessarily mean going for runs or lifting weights. Household chores like dusting and vacuuming can also be considered exercise – just moving around is the right means to a sharper brain. Continue learning: Do you recall the expression, “You can’t teach an old dog new tricks? Well, that is a lie. No matter how old you are it’s empirical that you continue the learning process in order to prevent memory loss. Advanced education has been linked with better brain function. This doesn’t mean you had to go to university; even if you didn’t go through all the levels of schooling you can still continue to learn in your daily life. Everyday learning can be as simple as reading a book or taking up a new hobby. Don’t fret over having to sit in a classroom again because benefits can be seen from everyday tasks as well. Don’t smoke: Smoking is linked to a slew of health problems, so it should be no surprise that is can promote memory loss as well. Research has shown that smokers are less likely to recall people’s names and faces than non-smokers. Furthermore, smoking is linked with illnesses and conditions which can also contribute to memory loss. Eat well: There are numerous food items you can enjoy to boost memory and enhance memory power. Some brain-healthy foods include oily fish, eggs, nuts, lean meats (like chicken or turkey) and, of course, plenty of fruits and vegetables. These foods offer the essential nutrients to make for a powerful brain. Knowing what to eat is only half the equation – it’s important to stay away from certain foods as well. These include saturated and trans fat, highly processed and sugary foods and, of course, keep alcohol consumption to a minimal. Maintain strong social ties: It doesn’t matter if you have one close friend or 10, to maintain your memory ensure your social ties are close. Time and time again research has shown the role of social connections in memory and has shown that having close friends can mean better memory. Isolation has been tied to poor cognitive function – especially in those who are sedentary. Even if you are unable to go out and visit friends, stay in touch with the phone or other communicative technology devices. If you don’t have many friends, use your time to volunteer in the community or attend community functions. If you want to ensure you’re remembering everything you take in, there are additional tips in order to enhance memory power. Eat memory-boosting foods: Some foods work to improve our brain health and other foods can enhance memory power. These foods will reduce brain fog and improve concentration. 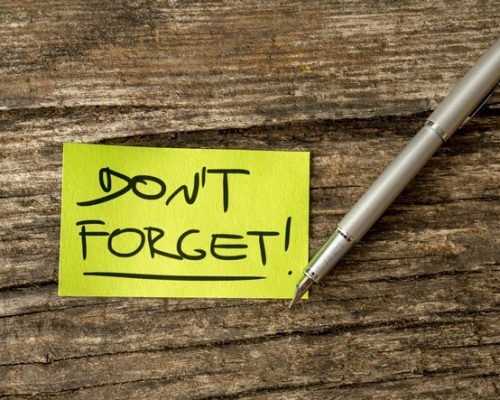 Tackle regular forgetfulness: Here are some effective tips to help combat forgetfulness and enhance memory power. These tactics were developed by the Center for Cognitive Remediation and Treatment. Associate the name with an image, rhyme, etc. You don’t have to succumb to age-related memory loss, especially now that you have the tools and tips to prevent it. Aging can be graceful, and you can continue to feel like yourself and retain all your memories, as long as you put some work into it.